Want to hear me talk about poetry? Here's a PA Spotlight segment from KCSB with reporter Jenny Boyar. We talk the SB poetry scene, about my book, and I read a poem too. Years of Poetry All in One Book! It's here! 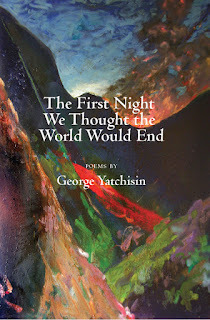 My first full collection of poetry, The First Night We Thought the World Would End, has been published by Brandenburg Press. You can get it at Chaucer's in Santa Barbara or online starting April 1 (no joking!) at that Amazon place. In fact, you can pre-order now, if you'd like. "It's this looking closer and his ability to bring to life the details in clear and often beautiful language that urges us to keep reading these poems," writes Gerry LaFemina. "There's a gathering feeling to this book; meditative and lyrical, his poems contemplate a range of wonders from the minutiae to the grand," writes Alexandra Lytton Regalado. It’s easy to be intimidated by big, bad, bold Barolo, the delightful wine from the Piedmont in Italy made from nebbiolo. It needs time in-bottle to even its tannins, it’s usually not cheap, and you feel like you need to make a perfect porterhouse to pair it with. But relax, there’s this Fontanafredda (suggested retail $45) from one of the historic producers from the region. Want ot read the rest then do so at the Independent's site. 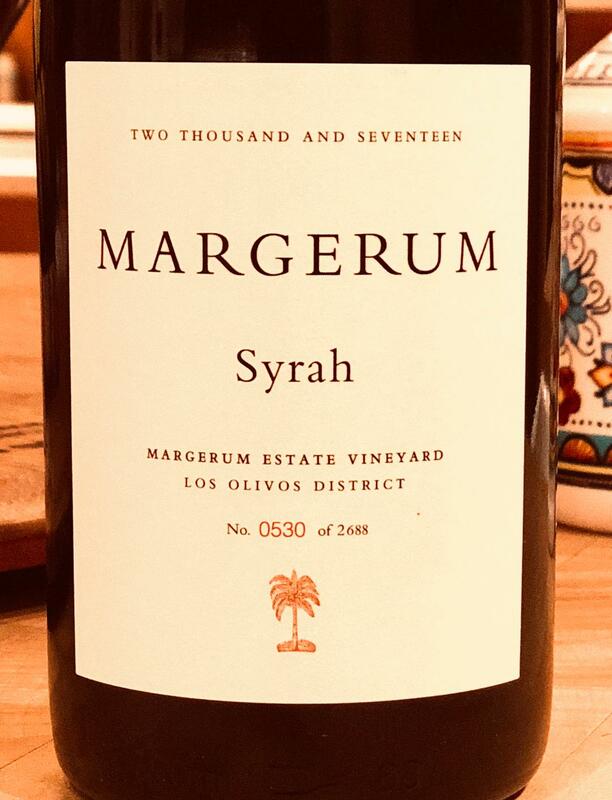 After years of buying great grapes from others to make his wines, Doug Margerum signed a long-term lease at Honea Vineyard a couple of years ago so that he could better create his own estate wines. 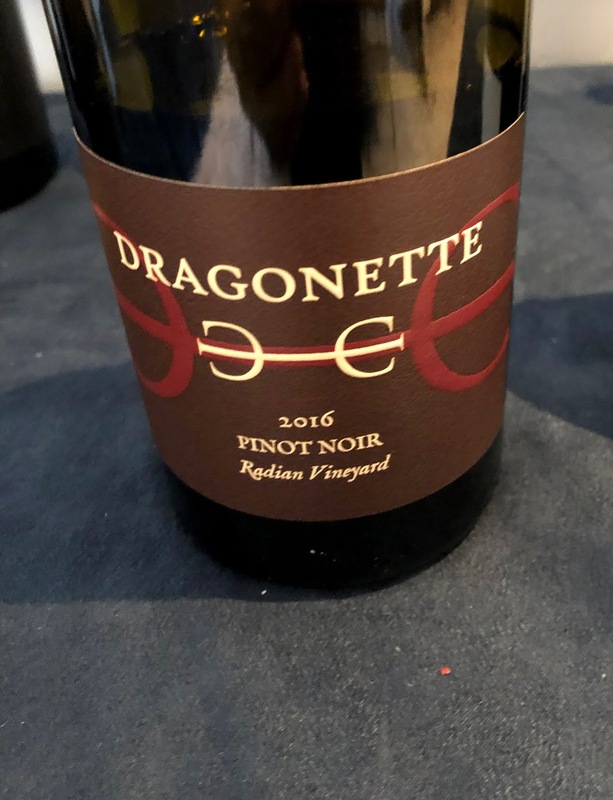 One of the great joys of returning year after year to an event like World of Pinot Noir is you get to reunite with old friends. 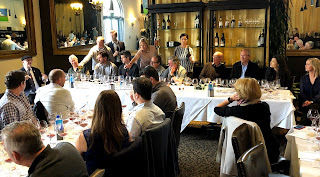 Sometimes that's a winemaker you only see annually for ten minutes at a tasting in a big Bacara ballroom (hi, Anthony Beckman from Balletto--the wines are still rocking!). Sometimes that means one vineyard served several excellent ways. Sure, it's hard enough to decide whether you prefer pinots from Santa Maria Valley or Sta. Rita Hills, and it might depend on how your mood or the moon waxes or wanes that day. But it's pretty hard to argue the most singular, spectacular pinot noir coming out of the Sta. Rita Hills of late will have grapes from Radian. We're lucky that while Stan Kroenke, sad Rams owner, owns the deed--which means the man most in charge of the grapes is winemaker Matt Dees (for The Hilt)--he still knows enough to sell some of the fine fruit to people who will do it more than honorably, winemakers like Bryan Babcock, Ken Brown, Aaron Walker of Pali. And then there were some Radians to taste at WOPN, too. As is true with his house style, James Sparks of Liquid Farm makes a Radian that's lithe and ethereal--wine happily haunted by its own ghost. Of course, coming from Radian you can't escape the earthiness, an almost muskiness. All that diatomaceous earth--crazy good drainage that makes roots say, "Hey, where did that water go?" yet also, well I'm going to say it again--ghosts. It's fossilized algae, after all. You know, like "Soylent Green is other diatoms!" So sure, you get the usual Sta. Rita Hills fruit, cherry moving to cranberry to raspberry, but you get it after a good fight on land just-not-quite too close to the Pacific. Lots of intensity, few grapes, better wine. 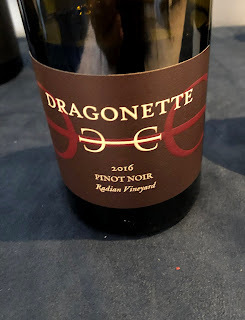 Like the one from Montemar, a garagiste so small their website is just a Facebook page, that only delivers magnificent fruit (they work with Bentrock, too, the partner-vineyard to Radian, but also much more straightforward--in topography if nothing else). A bit bigger and fuller than the Liquid Farm, if you want that (it's hard not too). And then there's the Radian from Dragonette. Damn. It's a glass of wine that you drink wine for, hoping and not quite finding enough. Brandon Sparks-Gillis poured me my sample, watched my face go stupid with happiness after my taste, and simply said, "It's a magical place." Trying to figure out a way to describe it I've landed on this--it's the girl in Richard Thompson's exquisite "Beeswing," the one with animal in her eyes, the one for which the song's narrator sings, "If I could just taste/All of her wildness now/If I could hold her in my arms today/Then I wouldn't want her any other way." But let's not get caught up in that feminine/masculine wine reduction, for while Radian is a pretty wine, it's pretty like James Dean. So let's consider the wine also biker outlaw James in Richard Thompson's even more famous "1952 Vincent Black Lightning." A bit dangerous, and therefore glamorous, because, c'mon, we all love the bad boy, the femme fatale. And just as Thompson can finger-pick so much all at once, this wine's got notes up its grapey sleeve for days. Importantly, these are both songs that tell stories, and someone needs to write the ballad of Radian. Peay is four miles off the Pacific near Sea Ranch, where writer Denis Johnson lived and died, which is sort of a weird hint at something fierce and moving in a location, if you ask me. The vineyard site is at some elevation but not too much, so they get ocean fog but it doesn't necessarily linger; their grapes certainly do, though, getting a crazy long growing season mostly because they have to. It's also pretty clear that winemaker Vanessa Wong prefers nuance to force, and therefore as soon as you stick your nose into a glass with her wines you tend to think about flowers more than fruit. That's not to say the wines lack fruit in their juice, but they offer so much more that they entice you to swirl, sniff, and sip again. And again. 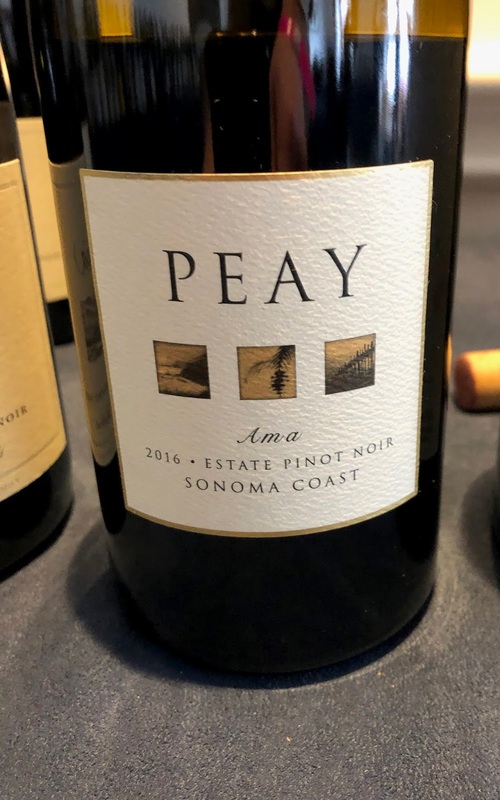 That's even true from one of the few wines Peay makes not from its own grapes, as they have access to the acclaimed Savoy site in Anderson Valley. WOPN offered a fascinating seminar on that vineyard, and amidst the fine wines we got to taste, Wong's stood out, as she talked about the wine from Savoy having a perfume more ethereal and elegant than many sites. Then again, teasing out all the extra notes wines too often steamroll over seems to be her skill. Simply put, if you want to learn what cold climate pinot is all about, try some Peay. And their three estate blends all achieve different aims, too, so drink as much as you can--the Ama is perhaps the heartiest, while the Scallop Shelf (guess what's in the soil?) is about structure and restraint, and let's hope you know enough to know what precisely doled out satisfaction can be like. Then the Pomarium, planted aside an old apple orchard, even takes on that apple-y terroir some, with a dynamic tartness. It's not every day I swirl and sniff a wine and almost cry. But it's not every day I get to taste a 1997 Foxen Julia's Vineyard, and suddenly get sensorily sucked back a couple of decades into my life when I was a much younger man just beginning to learn and love Santa Barbara wines. Julia's Vineyard was one of the first vineyard designates I can recall once I moved out to California in 1994 (beyond the venerable Bien Nacido, of course), and something about that lovely enveloping barbecue+spice+deep fruit nose erased years for me today at a Julia's Vineyard Seminar and Luncheon at the Wine Cask today as an estimable overture to World of Pinot Noir. Of course it doesn't hurt to have Julia herself at the lunch tasting: The vineyard was planted in 1988 when she was 6 months old. (And yes, Katherine's Vineyard, famed for its chardonnay, is named after Julia's sister.) It's owned by Jackson Family Wines, the ninth-largest wine enterprise in the United States that owns 55 wineries globally (including Brewer-Clifton, Byron, Cambria, Nielson locally). But despite all that BIG, they certainly care about small, and about relationships. 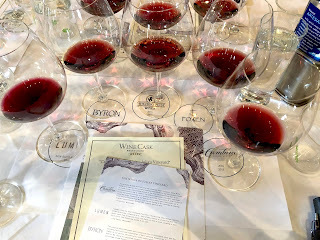 For the event featured five wineries/winemakers who have been making beautiful juice from Julia's grapes for decades now: Cambria (as they get to play with the whole vineyard), plus Lumen/Lane Tanner, Byron, Hitching Post, and Foxen. MC master sommelier Michael Jordan (no relation to any other famous MJs) asserted that he not only "had a flag and a drum for the Santa Maria Valley," citing its 212 days of hang time for pinot grapes, more than anywhere in the world, but also, "if there was an American Grand Cru designation, Julia's would be it." Surely there's nothing better than tasting through bottlings of this vineyard from 1996 to a 2018 Lumen barrel sample that Lane Tanner cleverly compared to tasting cookie dough, as we had to imagine what it would be like after it had time to "bake," so to speak. (It's going to be a scrumptious cookie.) As she said about Julia's in general, "There's always a smokiness...I always imagine that bar you go into late at night and there's a gorgeous woman at the end of the bar and you don't know if you should go there....."
Fanciful, sure, but it's a vineyard that leads to wine that leads to such heady thoughts, something to dream on. For as Jordan put it, "We like to over-complicate ans over-simplify at the same time, not just as sommeliers--it's the human condition." A wine as profound as one from Julia's let's you find a just right space, with flavors expansive yet precise, with structure exact and elastic.